You want to lose them, we want to find them! Before the use of chemical treatments to eradicate termite infestations, Melbourne and other such areas-built constructions with the floor raised above ground level. These "Melburnians" type of houses had ant caps (steel caps) fixed to the piers top portion to ensure that any termite building activity was spotted before the house was attacked. 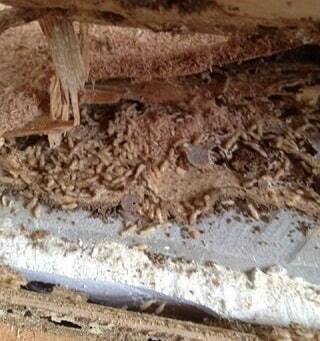 Regular inspections were necessary of course but this summed up the plan for termite protection Melbourne. From the end of the 1950s to the beginning of the 1960s, chemical treatments such as pesticides emerged that were applied on concrete slabs before the house was built. Not only did this work better than the old termite prevention measures, it was considered the key way to building homes. Soon side effects from caused by the chemicals began to cause fear among people in the 70s & 80s and people started avoiding pesticides in beginning of the 90s. 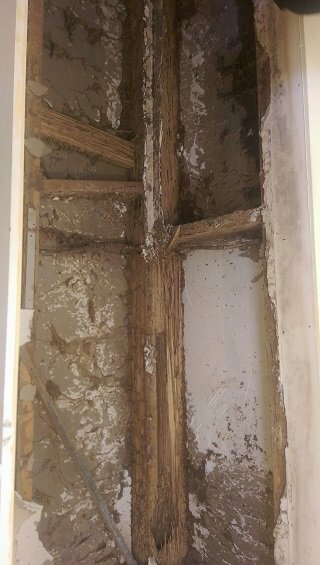 The industry of construction sank into confusion as to how to build the ideal home in termite-prone areas since no other prevention methods or substitutes for pesticides seemed to work. Soon, after new methods and products started to hit market shelves. They lacked effectiveness but caused no harm. Although limited in its own way, one of the most significant milestones were monolithic slabs because the formation of the slab encouraged it to be a non-destructible barrier against these insects while exposing any of their mud like formations upon itself. Since then solutions like pre-impregnated termiticidal blankets, non-repellent termiticides, termite interception and colony elimination systems along with upgrading the level and methods of inspection have arrived. Today modern removal and control techniques need to be performed by certified and trained professionals. Most homeowners do not realise they have these pesky little insects until the infestation gets very bad. The most important species of these pests live underground in a group of two million that each travel up to 50 meters away from their nest in search of food. These pests are known to travel in into and through your home using mud tunnels to hide their activity. They are also known to start devouring walls, furniture or other parts of your home by eating it from the inside out. Even homes built on concrete slabs suffer such a threat. Termite monitoring: This method helps experts regularly check to see if termites are trying to get into your home. Chemical termite barriers: This method can be used at any stage of a buildings life and not necessarily only for new constructions. Physical termite barriers: These are specifically created to prevent these insects from getting near the structure and to drive them out in the open to be spotted instead. These stop subterranean termites from gaining access to your home. The reticulation system: This makes reapplying the chemical barrier to prevent these pesky creatures in an easier manner. 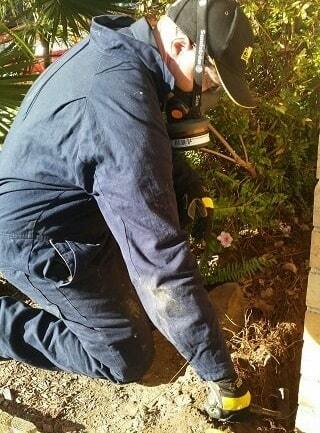 Carry out termite inspection in the area you need to construct in. Preferably even set up a termite monitoring or baiting system. Get a certificate vouching for the treated zone so that you know the treatment has been compliance with Australian standards 3660 of all works. You will need to submit this certificate to your local council. Ask the service you're employing for the different treatment and budget options and get one that matches your need. Do remember to ensure their work is guaranteed. The builder, along with the developer, architect as well as the owner need to know the details of the Building Code of Australia also known as BCA and the Australian standard AS3660. 1-2014. Under this code, the specifications say a termite chemical barrier like a termite penetration pipe collar, should be applied before or after the concrete slab, and brick piers, stumps as well as footings. Secondly, the perimeter of the house should be secured with a physical termite blanket or reticulation system product. Follow instructions provided to you by your builder and pest control service. Having a termite barrier installed and refrain from disturbing it. For homes built on concrete slabs, ensure that all parts of the slab are left open in order to be able to immediately notice any kind of activity by these property destructing creatures. Refrain from storing any kind of debris, timber or other cellulose material against the subfloor, near external walls of your home or base of your home as termites, can be drawn to the same. Ensure there is no moisture and all surrounding areas are dry including vents to sub-floor areas. Avoid having any leaking pipes or taps by getting them repaired as soon as they start leaking. Do not use any kind of untreated wood or timber. Involve your pest control service in any changes you plan on making to your home. Ensure the overflows of your air conditioner or hot water are directed away from your house and properly disposed of. Refrain from allowing plants to grow against the structure of your home no matter how much of a greenery lover you are. Have dead trees, stumps or plant waste removed from your property. Regularly check termite shielding and maintain the same without adding any changes to it. Refrain from having house-connecting constructions built like verandahs or pergolas. In case of any constructions ensure that the timber formwork is removed and disposed of correctly. Have all timber fence and support posts constructed with a 50mm clearance between the timbers and soil. Why choose Protech Pest control services? Protech Pest control is a renowned name in the field of termite control and removal since the past 26 years. Our special team of trained and certified professionals is highly equipped in delivering the best solutions for all your pest problems. We strive to ensure 100%customer satisfaction and in providing quality services that abide by the Australian and environmental safety standards. As a company that ensures that you and your family comes first, we ensure that all our resolutions are effective yet safe, thereby helping you provide a pest free and healthy environment for your loved ones. We offer advice, quotes and same day service and use the best quality equipment and products to detect and get rid of termites. All our technicians undergo a 12-month course from TAFE and once they complete their training, they start working at grade set (3) III. With further on-ground experience, they get promoted to grade set (4) IV in integrated insect management, which is the highest in pest control. Currently, some of our technicians hold the grade set (4) IV, and they are licensed from the Australian Health Department. 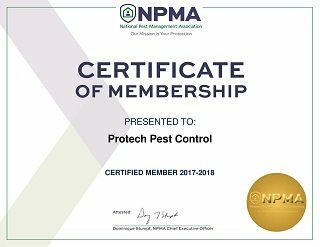 We are also members of some of the most premium associations in Australia, namely: National Pest Management Association (NPMA) and The Australian Environmental Pest Managers Association (AEPMA).